For meeting the diverse requirements and demands of customers, we formulate and supply an exclusive range of Common Solvents. Our range encompasses Carbon Disulfide, Carbon Tetrachloride, Ethylene Dichloride and Isooctane. All our chemicals are widely acclaimed by the customers for their purity, accurate composition, longer shelf life and precise pH value. In addition to this, we have the capability to provide customized packaging to clients as per their requirements and demands. 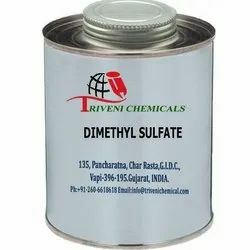 Dimethyl Sulfate is Colorless, Oily Liquid. Storage: Keep container tightly closed. Keep container in a cool, well-ventilated area.